BRAVERY: Left, Naeem Rashid and his son Talha. Naeem was originally from Abbottabad in Pakistan and was a teacher in Christchurch. In the video of the attack at the Al Noor mosque, he at one point attempts to tackle the gunman, but was shot. Widely hailed as a hero, his brother, Khurshid Alam, said he was proud of his actions after seeing the video. "He was a brave person, and I've heard from a few people there, there were few witnesses… they've said he saved a few lives there by trying to stop that guy," said Mr Alam. "It's a still a shock for us, whatever hero he becomes… it's our pride now, but still the loss. It's like cutting your limb off." 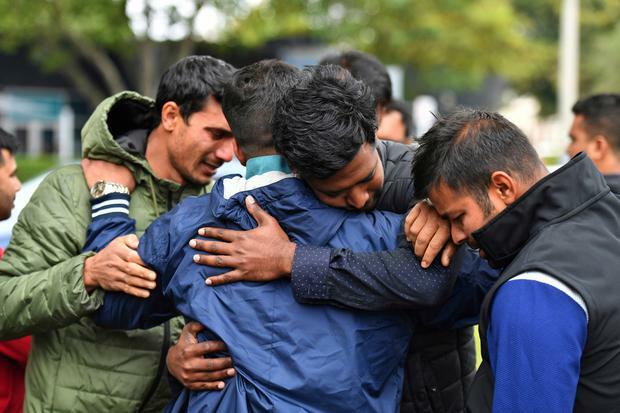 New Zealand's stricken residents reached out to Muslims in their neighbourhoods and around the country yesterday, with a fierce determination to show kindness to a community in pain as a 28-year-old white supremacist stood silently before a judge, accused in mass shootings at two mosques that left at least 50 people dead. Brenton Harrison Tarrant appeared in court amid strict security, shackled and wearing all-white prison garb, and showed no emotion when the judge read him one murder charge. The judge said "it was reasonable to assume" more such charges would follow. Tarrant, who posted an anti-immigrant manifesto online and apparently used a helmet-mounted camera to broadcast live video of the slaughter in the city of Christchurch, appeared to make a hand sign, similar to an OK sign, that is sometimes associated with white nationalists. 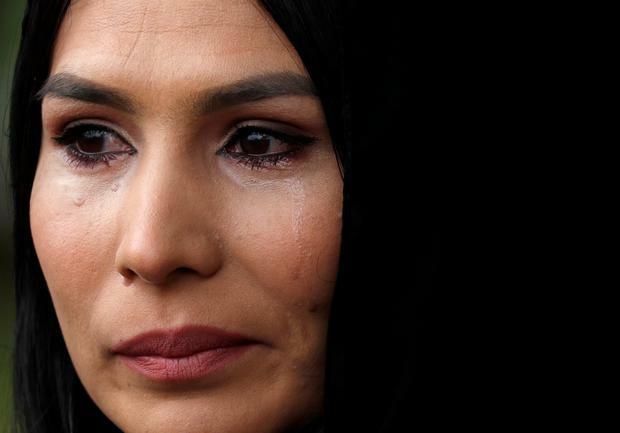 The massacre during last Friday prayers prompted a heartfelt response from Prime Minister Jacinda Ardern, who pronounced it "one of New Zealand's darkest days" and said the shooter, an Australian native, had chosen to strike in New Zealand "because we represent diversity, kindness, compassion". Her fellow countrymen seemed to want to prove her right by volunteering acts of kindness. Some offered lifts to the shops or volunteered to walk with their Muslim neighbours if they felt unsafe. Ardern said 38 survivors remained in hospital yesterday, with 10 critically wounded. But updates were slow to come, and many families were still waiting to hear whether their loved ones were among the victims. Last night one of the hospitalised victims died, bringing the total dead to 50. Outside one of the two mosques, 32-year-old Ash Mohammed pushed through police barricades in hope of finding out what happened to his father and two brothers, whose mobile phones rang unanswered. An officer stopped him. Here are the stories of some of those who were killed in Christchurch. Mucad Ibrahim was lost in the melee when the firing started at the Al Noor mosque as his older brother Abdi fled for his life and his father pretended to be dead after being shot. 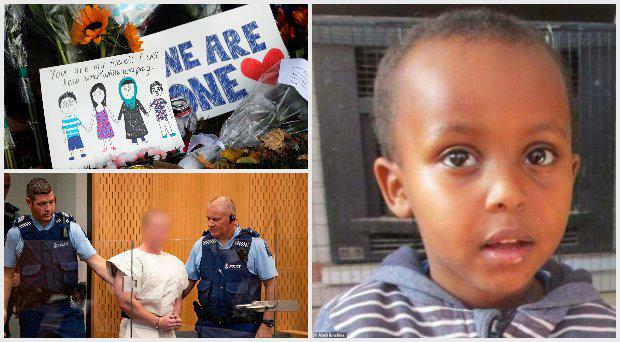 The New Zealand Herald reported that the family searched in vain for the toddler at Christchurch hospital and later posted a photograph of Mucad, smiling with Abdi with the caption: "Verily we belong to God and to Him we shall return. Will miss you dearly brother". Four of Adan Ibrahin Dirie's five children managed to escape Friday's attacks, but the youngest, Abdullahi, was killed, his uncle, Abdulrahman Hashi, 60, a preacher at Dar Al Hijrah Mosque in Minneapolis, told the New Zealand Herald. Dirie also suffered gunshot wounds and was taken to hospital. The family fled Somalia in the mid-1990s as refugees and resettled in New Zealand. "You cannot imagine how I feel," Mr Hashi said. Sayyad's mother, Noraini, was also in the mosque and managed to escape, Ms Henry said. The teenager has two other siblings, 15-year-old twins Shuayb and Cahaya. Ms Parvin died being struck by bullets while trying to shield her wheelchair-bound husband, Farid Uddin Ahmed, her nephew Mahfuz Chowdhury told The Daily Star, a Bangladeshi newspaper. Mr Chowdhury said Uddin had been ill for years and Ms Parvin took him to the mosque every other Friday. She had taken him to the mosque for men while she went to the one for women. Mr Chowdhury said relatives in New Zealand told him when the shootings began, Ms Parvin rushed to her husband's mosque to protect him. He survived. The Bangladeshi couple had moved to New Zealand sometime after 1994, Mr Chowdhury said. As the shootings unfolded, Naeem Rashid is seen on video trying to tackle the gunman, according to his brother, Khurshid Alam. Mr Alam told the BBC: "He was a brave person, and I've heard from a few people there, there were few witnesses . they've said he saved a few lives there by trying to stop that guy." Mr Rashid's son, Talha Rashid, is also among the dead. Pakistan's Ministry of Public Affairs confirmed their deaths in a tweet. Mr Rashid's brother, who lives in Pakistan's garrison city of Abbottabad, Dr Mohammad Khursheed, received a call from his sister-in-law telling him of his brother's death. Dr Khursheed said his brother had already bought his plane ticket to Pakistan for a May family reunion. "He was very brave. He snatched the gun and I think he saved many lives," Dr Khursheed said. Mr Nabi moved his family to New Zealand in 1979 to escape the Soviet-Afghan war. Days before the shootings, his son, Omar, recalled his father speaking about the importance of unity. He told the news network his father ran an Afghan Association and helped refugees settle in to a new country. "He used to make them feel at home." Mr Ahmed had recently moved from his house in Karachi, Pakistan for a job in New Zealand to help support his family back home. On Saturday, Pakistan's foreign ministry informed his family that he was among those killed during the mosque attack. "He had done Charted Accountancy from Pakistan. He was the only son to his parents. He had only one younger sister ... He had only started his career, but the enemies took his life." Family members, relatives, and friends have gathered at Mr Ahmed's house to express their condolences. His body is expected to arrive there in coming days. The owner of the convenience store next door, JB's Discounter, Jaiman Patel, 31, said he helped the staff with the keys after the terrorist attack that claimed Mr Khan's life. "He's a really good guy. I tried to help him out with the set-up and everything," Mr Patel said. "We also put the key out for them when the terrorists come, and sorted it out for him." Mr Khan had a son who was 10 or 11, Mr Patel said. They included Asif Shaikh (44), who said he was among more than 100 people at the Al Noor mosque when the attacker came in. He said he survived by playing dead, but was desperate to know what happened to his friends who were there with him. Nearby, Akhtar Khokhur leaned on the shoulders of her friend and cried as she held up her mobile phone with an image of her husband. Khokhur (58) and husband Mehaboobbhai Khokhur (65) had travelled from India to spend time with their son Imran, their first visit in the eight years since he moved to New Zealand. The couple was due to fly out tomorrow. Imran had dropped off his father, an electrical engineer, at the Al Noor mosque and was looking for a parking space when the shooting began. They have not heard from him since. He livestreamed 17 minutes of the rampage at the Al Noor mosque, where, armed with at least two assault rifles and a shotgun, he sprayed worshippers with bullets, killing at least 41 people. More people were killed in an attack on a second mosque a short time later. The video showed the killer was carrying a shotgun and two fully automatic military assault rifles, with an extra magazine taped to one of the weapons so that he could reload quickly. He also had more assault weapons in his car, along with what appeared to be explosives. Two other armed suspects were taken into custody last Friday while police tried to determine what role, if any, they played in the cold-blooded attack that stunned New Zealand. Tarrant's relatives in the Australian town of Grafton, in northern New South Wales, contacted police after learning of the shooting and were helping with the investigation, local authorities said. Tarrant has spent little time in Australia in the past four years and only had minor traffic offences on his record. During yesterday's morning hearing, a man who was not present in court was charged with using writings to incite hatred against a race or ethnicity, but it was not clear if his case was related to the mosque attacks. New Zealand, with a population of five million, has relatively loose gun laws and an estimated 1.5 million firearms, or roughly one for every three people. But it has one of the lowest gun murder rates in the world. In 2015, it had just eight. "I can tell you one thing right now, our gun laws will change," Ardern said. She did not offer details, but said a ban on semi-automatic weapons would be looked at. Neighbouring Australia has virtually banned semi-automatic rifles from private ownership since a lone gunman killed 35 people with assault rifles in 1996. Before last Friday, New Zealand's deadliest shooting in modern history took place in 1990 in the small town of Aramoana, where a gunman killed 13 people following a dispute with a neighbour. Ellie Cullen A survivor of the Christchurch mosque attacks whose wife was killed in the tragedy broke down as he recalled his heartbreak to the Duke of Cambridge.